Is your trash can still taking up precious kitchen space? Instead of leaving the area under your sink as space where unwanted cleaners go to die, put it to better use with a pull-out trash can and recycling bin. Particularly useful in small spaces where trash and recycling can make the kitchen feel cluttered, pull-out trash can installation can quickly and easily add practical functionality. And depending on your familial situation offers an added opportunity for the dog, cat, and kid-proof trash protection. How Hard is it to Install a Pull-Out Trash Can? 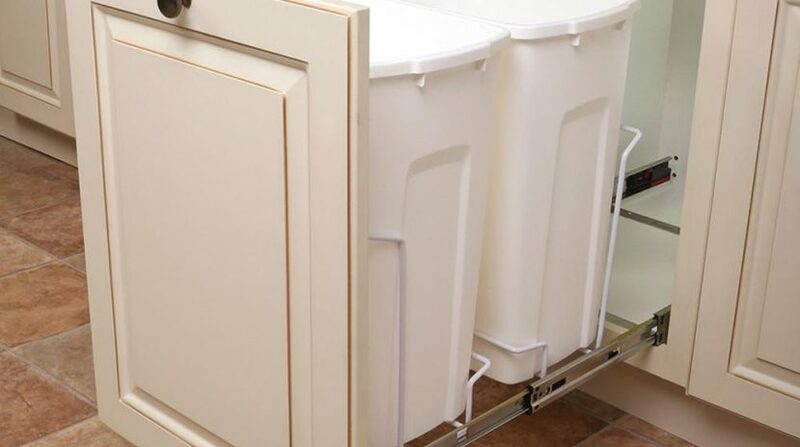 Pull-out trash can installation is an easy job for the moderately-experienced DIYer. The task can be accomplished in less than half-an-hour with a pull-out trash can conversion kits available at your local hardware store or online, most of which include compatible trash can(s). Choosing a single-door cabinet, measure the height, width, and depth – to find the product right for your installation. Be sure to get one with (or purchase an additional) door mounting kit. This will enable the entire door to slide out along with the trash cans. Make sure cans are included, or note dimensions of compatible options. NOTE: For those with a built-in shelf in their under-the-sink cabinet, the process can be slightly trickier, allowing for only a small trash containers, or requiring some power saw action. Visit the store or shop online. How old are those cleaners?! Take off the hinge hardware and remove the door completely. Assemble the pull-out trash can/door mounting kit per manufacturer instructions. Per the manufacturer instructions, mark screw holes on the bottom/sides of the cabinet and attached slides with a pencil. NOTE: If your cabinet has a ‘lip,’ you may have to shim up the kit. Using a bit slightly smaller than your screws, pre-drill holes for easy, straight screw installation. Screw in the hardware kit/slides on each side of the inside cabinet per manufacturer instructions. If your measurements weren’t accurate, or your cabinet isn’t quite square, this could require some tinkering/shimming. If the kit contains a back bracket for the slides, install these onto the back wall of the cabinet, mounting with a thin piece of wood and shimming as necessary. Attach hardware to the cabinet door. Measure from the bottom of the cabinet face frame to the bottom of the pull-out hardware, transferring those measurements to the back of the cabinet door. Next measure the width, centering and attaching the hardware to the door. Slide the pull-out unit into the glides, followed by the trash cans. Trying to remember NOT to toss trash where your garbage can formerly lived. In case you haven’t figured it out, though technically a ‘simple’ project, cabinet door kits necessitate several steps and even some problem solving due to the differences in cabinetry. Need a hand with pull-out trash can installation? Find your friendly neighborhood Pro Handymen or call us for repair, maintenance, improvement or installation help in your home or business today.